Today's Home Office-related coverage includes the Home Secretary's speech at a policing summit, the Bishop James Jones report into the experience of Hillsborough families, an extradition case, and the Home Office's foreign aid spending. 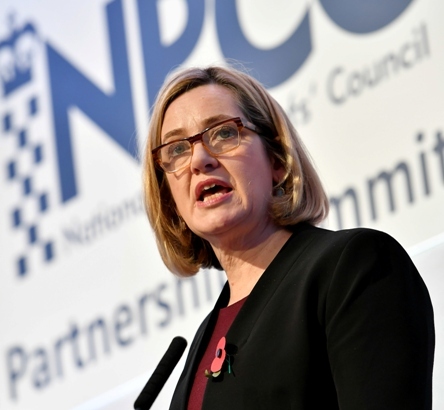 There is widespread coverage, including in the Guardian, ITV News, the Sun and the Times, of the Home Secretary’s speech at the National Police Chiefs’ Council (NPCC) and Association of Police and Crime Commissioners (APCC) summit yesterday. The papers report that the Home Secretary called on police to request extra money on “evidence and not assertion” and to tell local communities and the victims in your area what the plan is to make them safer. The Mail also reports that the Home Secretary also promised greater protections for police in pursuit of criminals in vehicles and The Mirror highlighted the £27million in funding through the Police Transformation Fund she announced. There is widespread coverage of the Bishop James Jones report into the experiences of Hillsborough families and Bishop Jones appeared on the Today programme this morning. The coverage notes that families have backed a “Hillsborough law” to make it a crime for public officials to cover up wrongdoing, calls for curbs on public bodies spending on legal costs and for a “change in attitude” in how bereave families are treated. The Home Secretary’s comment on the report can be found below while the report is available on gov.uk. I am grateful to Bishop James Jones for undertaking this important piece of work. His thoughtful and considered report raises important points. The government will now carefully study the 25 points of learning and we will provide a full response in due course. The BBC, Sky News, and Manchester Evening News are among media outlets that report Greater Manchester Police has been granted an arrest warrant for Hashem Abedi, the brother of Manchester Arena bomber Salman Abedi. A statement from the Security Minister is below. We have been clear from the outset that we are determined to do everything in our power to ensure that those suspected of being responsible for the Manchester attack are brought to justice in the UK. That is why the Home Secretary agreed to request the extradition of Hashem Abedi, who has been named as a suspect by Greater Manchester Police, and we continue to work closely with the CPS, police and Libyan authorities to return him to the UK. This was a callous and evil act and the victims and their families deserve and demand justice. They must remain our priority and we will therefore not be commenting further so as not to jeopardise the investigation. The Express reports that the Home Office is spending “almost £1 million a day” to house and feed asylum seekers and refugees. The paper reports that the “majority” of the £362 million the department contributes to foreign aid is “swallowed up by migrants”. The majority of the Home Office Overseas Development Aid budget is spent on asylum support and the Syrian Vulnerable People Resettlement Scheme. The Home Office also supports projects to build the capacity and capability of recipient countries to deal with border security, drug smuggling, modern slavery and child protection online. This benefits the recipient countries by helping them to improve their governance and positively impacts their economic development and welfare. In addition, the Home Office's spend on asylum support and the resettlement schemes helps protect vulnerable people from these countries here in the UK.